. 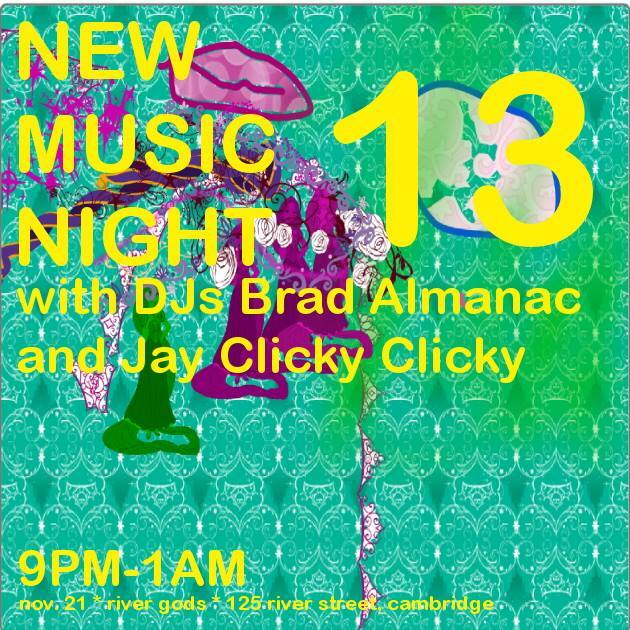 : New Music Night 13 with DJs Brad Almanac + Jay Clicky Clicky | River Gods | 21 Nov.
New Music Night 13 with DJs Brad Almanac + Jay Clicky Clicky | River Gods | 21 Nov. It's New Music Night 13, the baker's dozen, the triskaidekaphobic's delight, the big kahuna, the tallest Tom Collins, the BEST JERRY, the BEST. On this night, Nov. 21, 2013, Brad de la 'Nac and Jay of Clicky Clicky Music Blog will electrically coax music from the lightboxes and hoozywhatzits in the DJ booth at River Gods. In fact, it will be nothing but new or not yet new or even pupal/larval indie music, primarily carrying the rock stripe, but making the occasional foray into ambient or electronic-sounding sounds. It will help you slide into the holiday season, as we'll be a week out from American Thanksgiving, and perhaps you'll be able to keep that slide going, Pete Rose-stylee, straight through to New Year's. We'll try to soundtrack the auspicious beginning of that thing you'll do, with the best in new music. All of this happens that particular Thursday within the friendly confines of Cambridge's finest neighborhood pub. For a sense of what you're getting into, check out Brad's playlist from the October event, or our very own. Solid. Sold? Thinking about it? Here's the Facebook event page, why not click on over and pledge your allegiance?